That's right, every partner site will have an iPad/iPhone/iPod optimized Web app that can be bookmarked and run as an app. Looks like an app, feels like an app, runs like an app, and everyone gets one. Full HTML 5 support allows for super-fast song playback and touch navigation allows you and your clients full access to your site on all mobile devices. Now your clients can be on the go and still have full access to your music and all of their projects. For more info on Web apps take a look at the details here on Apple's website. Step-by-step license creation tool - Clients go through 4 simple steps to select their cue, define their usage, pay instantly and obtain their invoice and license electronically. Custom rate card integration - There's no need to conform to other standards or rate card breakdowns on SourceAudio. We take your rate card and integrate it into the system exactly how you have it set up. Make an offer system - We've built in a system that allows clients (or other users who have access to your site) to make an offer for a cue if they have special circumstances or their usage isn't specifically defined in your rate card. You can make counter offers, reject the offer, or accept the offer with one click of the mouse and you're on your way to getting another deal done. 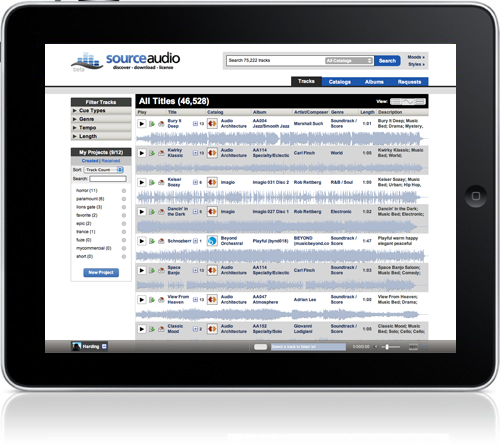 Fully integrated payment system - All SourceAudio partner sites can take credit card payments instantly. All major credit card types are accepted and we will soon be able to collect funds in $USD, $CAD, British Pounds, and the Euro. 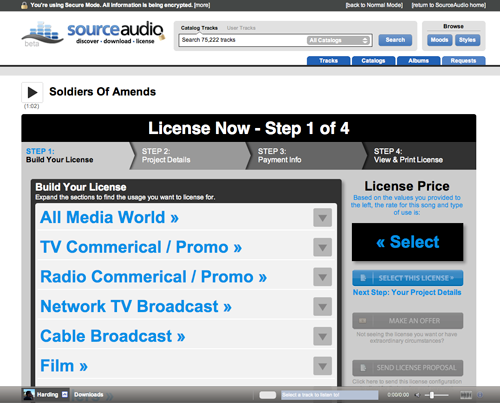 License and Invoice PDF generator - SourceAudio will take your clients' information, the project details, and your business information and dynamically build out licenses and invoices for each and every license sold, in real time, without delay. Invoices and licenses will have a custom look and feel with logo and contact information placements situated nicely at the top of the documents. Users can even preview invoices and licenses prior to submitting payment. For those partners who would like to open up downloads to more users but want to be able to monetize those downloads and their content, we're building out an end-to-end e-commerce system that will make this possible. 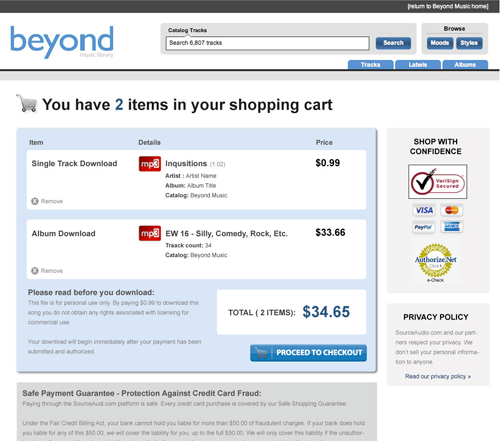 Music reps can set the prices they want to charge for each song (or all songs at once) and then users pay for each song downloaded. Partners can still make some clients exempt from this fee system but for all others, it's a nice way to earn incremental revenue from the great content sitting on your site. We know our partners don't want to make all of their tracks available to every user. Some clients only need to see specific catalogs or labels and for this use case we have created the new user access permissions & restrictions tool. 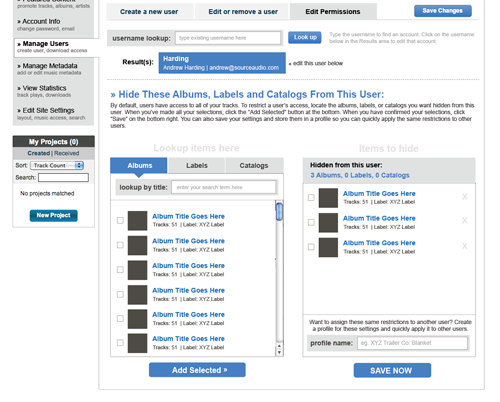 With this tool you can define which music is available to each and every user. Think of it as customizing the site and music a user can see based on your business relationship with them and the music they can license from you. The design above is TBD but development is very close to being complete. So there you have it. Lots of good stuff going on. We will keep you updated on the progress and availability of each of this big features. Feel free to contact us if you have any questions!